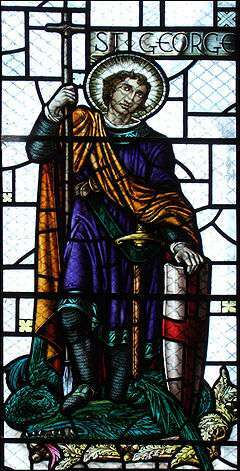 Saint George depicted in a stained glass window in the St Mary the Virgin's Church, South Darley, Derbyshire. Saint George is the patron saint of England in a tradition established in the Tudor period, based in the saint's popularity during the times of the Crusades and the Hundred Years' War. Veneration of the saint in folk religion declined in the 18th century, but attempts to revive celebration of Saint George's Day (23 April) as an expression of English culture and identity go back to the foundation Royal Society of St. George in 1894 and have more recently, since the beginning 2010s, resulted in Saint George's Day celebrations with aspects of a national holiday in England. St George with an earl of Lancaster (probably Edmund Crouchback), from an English Book of Hours, c. 1330. The earliest documented mention of St George in England comes from the Venerable Bede (d. 735). His feast day is also mentioned in the Durham Collectar, a 9th-century liturgical work. The will of Alfred the Great is said to refer to the saint, in a reference to the church of Fordington, Dorset. Early (c. 10th century) dedications of churches to St George are noted in England, for example at Fordington, Dorset, at Thetford, Southwark and Doncaster. St George rose to high popularity as a warrior saint during the time of the Crusades, but he had no special identity as a patron saint of England during the High Middle Ages. The saint most closely associated with England until the 14th century was Edward the Confessor. St. George's feast day in England was no different from the numerous saints on the liturgical calendar until the Late Middle Ages. In the past, historians mistakenly pointed to the Synod of Oxford in 1222 as elevating the feast to special prominence, but the earliest manuscripts of the synod’s declaration do not mention the feast of St George. 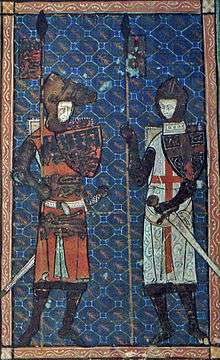 St George's Day was elevated to a "double major feast" in the declarations of the Province of Canterbury in 1415 and the Province of York in 1421, but George was still eclipsed by his "rivals" Saints Edward and Edmund. St George finally rose to the position of the primary patron saint of England during the English Reformation, with the revised prayer book of 1552, when all religious flags, including all saints' banners except for his were abolished. The first recorded use of St. George's Cross as an English maritime flag, in conjunction with royal banners, dates to 1545. In 1606 it was combined with the Scottish St. Andrew's Cross to form the Union Jack. In his play Henry V, William Shakespeare has the title character utter a now-famous invocation of the Saint at Harfleur prior to the battle of Agincourt (1415): "Follow your spirit, and upon this charge Cry 'God for Harry, England, and Saint George!'" At Agincourt many believed they saw him fighting on the English side. The tradition of celebration St George's day had waned by the end of the 18th century after the union of England and Scotland. The Royal Society of St. George, dedicated to promoting English culture including St George's Day, was founded in 1894. The rural tradition of Pace Egg plays, which involve Saint George as the character of the "hero", is recorded in the early 17th century. St George was selected by founder Robert Baden-Powell as the patron saint of the scouting movement and British scouting organisations such as The Scout Association continue to celebrate St George's Day. Most scout districts host events on the Sunday closest to St George's day, often a parade and religious service for their members. A certain revival of the position of St George as the patron saint of England has been observed from the later 1990s to early 2000s. Notably, the Flag of England (the Saint George's Cross), which in the 1980s had mostly been reserved for political English nationalism, started to be displayed as representing England by football fans since the mid-1990s, and the flag is now frequently flown throughout the country both privately and by local authorities. In parallel, a revival of St George's Day as an English national holiday has been encouraged by organisations such as English Heritage and the Royal Society of Saint George, partly in reaction to calls to replace St George as patron saint of England. including a 2003 BBC Radio 4 poll on the subject. On St George's Day 2002, the Campaign for an English Parliament protested at the mayor Ken Livingstone's lack of support for St George's Day, while announcing plans to spend GBP 100,000 to mark St Patrick's Day, by dyeing the fountains in Trafalgar Square red (responding to Livingtone's project of dyeing the same fountains green on St Patrick's Day). From this sprang the idea of a privately organised St George's Feast in London, the first of which was held in Covent Garden on 23 April 2003. 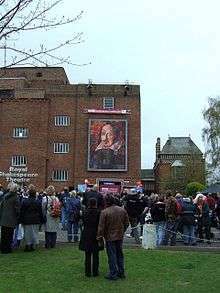 The festival grew in size and importance during 2004 to 2008, including performances of Punch and Judy, English folk dance Mummers Players, Morris dancers, English folk music etc. The Royal Society of St George asked to contribute in the 2006 event, which was now also covered by BBC Radio 3. In early 2009, Mayor of London Boris Johnson spearheaded a campaign to encourage the celebration of St George's Day. The event was first officially held in 2010, announced as "the first Pageant of St George in 425 years". The event has since grown into a major festival centered on Trafalgar Square and organised by the Mayor of London. In 2011, a campaign to make St. George's Day a public holiday in England began on the UK government's e-petition website. It received 4,266 signatures, not achieving the 100,000 signatures required before the deadline in August 2012 to make a debate of the matter in the House of Commons a possibility. In 2014, Andrew Rosindell, Conservative MP for Romford, argued in favour of giving St George's Day the status of an official public holiday. Additional celebrations involve the commemoration of the 23 April as William Shakespeare's birthday and death. Shakespeare is known to have been baptised on 26 April 1564 and to have died on 23 April 1616. 23 April is widely recognised as his traditional date of birth and commemorated on this day every year in his home Stratford upon Avon and throughout the world. in 1661 King Charles II of England was crowned in Westminster Abbey and on 23 April 1924 was the first broadcast by an English monarch (King George V at the opening of the British Empire Exhibition at Wembley). death of the Romantic poet Rupert Brooke (1887–1915). Wikimedia Commons has media related to Saint George's Day in England. 1 2 3 4 5 "Religions - Christianity: Saint George". BBC. Retrieved 2012-07-26. ↑ Bianchi, Hanael (2014). St. George's Day: A Cultural History of England's National Day. Owings Mills, MD: Caliber and Kempis. p. 38. ↑ "Froissart: The English in Portugal Mutiny". Nipissingu.ca. Retrieved 2012-07-26. ↑ Cheney, C. R. (1964). Councils and Synods and other Documents relating to the English Church Vol. II, Part 1, 1205-1265. Oxford: Clarendon Press. pp. 101, 104. ↑ Bianchi, Hanael (2014). St. George's Day: A Cultural History of England's National Day. Owings Mills, MD: Caliber and Kempis. p. 42. ↑ Perrin, William Gordon (1922). British flags, their early history, and their development at sea. Cambridge University. p. 40. ↑ McSmith, Andy (23 April 2009). "Who is St George?". The Independent. London. Retrieved 2010-04-23. 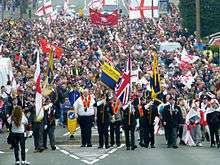 ↑ "St George's Day celebrations". The Scout Association. Retrieved 24 February 2013. ↑ Crutchlow, Dayle (2006-07-05). "Hands off our patron saint, by George!". Coventry Telegraph. Retrieved 2008-08-17. ↑ A new Patron Saint of England? (2008-06-26). "Suffolk – Community – A new Patron Saint of England?". BBC. Retrieved 2010-04-23. ↑ Pageant of St George returns to London after 425 years BBC News 23 April 2010. ↑ "Make St. George's Day a Public Holiday - e-petitions". Epetitions.direct.gov.uk. Retrieved 2012-07-26. ↑ "An A-Z of Important Dates in British History". Information-britain.co.uk. 1992-12-03. Retrieved 2012-07-26.